Carnival has now released another statement with the very latest details. Not just that but now the Carnival Magic has been refused to dock in Cozumel, Mexico by the countries authorities. The Carnival Magic, which was waiting off the coast of Cozumel, Mexico this morning to dock there for a scheduled port visit, had not received clearance from Mexican authorities to do so by 12 noon eastern time today and therefore the decision was made to proceed to Galveston to ensure the ship arrives there on time on Sunday morning. We greatly regret that this situation, which was completely beyond our control, precluded the ship from making its scheduled visit to Cozumel and the resulting disappointment it has caused our guests. The Texas healthcare worker on board continues to show no symptoms of illness and poses no risk to the guests or crew on board. The individual remains in voluntary isolation. Guests on the ship are being provided a $200 per person credit to their shipboard accounts and a 50 percent discount on a future cruise based on the missed visit to Cozumel. News of the Ebola outbreak has now officially hit the cruise industry after Carnival Cruise Lines today released a statement about a passenger who has handles Ebola blood samples 19 days ago. The Passenger in question had been cruising aboard the Carnival Magic on a western Caribbean cruise. The passenger works as a lab supervisor at Texas Health Presbyterian Hospital. and 19 days ago was handling Ebola samples from a patient who had been infected with the disease. 21 days is the incubation period for Ebola but passenger was cruising within this time period. The Ebola samples that were being dealt with in Texas were from a patient who died. Carnival states at “no point in time has the individual exhibited any symptoms or signs of infection” and there is a low risk to other guests on the 128,500 ton Carnival Magic from being infected. Late afternoon on Wednesday, Oct. 15., we were made aware by the U.S. CDC of a guest sailing this week on board Carnival Magic who is a lab supervisor at Texas Health Presbyterian Hospital. At no point in time has the individual exhibited any symptoms or signs of infection and it has been 19 days since she was in the lab with the testing samples. She is deemed by CDC to be very low risk. At this time, the guest remains in isolation on board the ship and is not deemed to be a risk to any guests or crew. It is important to reiterate that the individual has no symptoms and has been isolated in an extreme abundance of caution. We are in close contact with the CDC and at this time it has been determined that the appropriate course of action is to simply keep the guest in isolation on board. A cruise ship is one of the worse locations in the world for spreading infections and diseases. Ships are closed off and hold thousands of people in a small area. Often ships are reported of having Norovirus outbreaks which can also happen on land. None of Carnival Cruise Lines’ ships visit the region where Ebola cases are originating nor do our ships call in any countries with Level 3 CDC Travel Heath Notices. Any passengers or crew who have visited or traveled through Liberia, Sierra Leone and Guinea within 21 days of a cruise departure date will be denied boarding. Additionally, all guests sailing with us must answer a series of health screening questions during embarkation and, if deemed necessary, will be asked to submit to further medical screening prior to being allowed to board. All cruise lines continue to monitor the situation closely, along with our colleagues in the rest of the travel industry. The cruise industry is in close, frequent contact with the U.S. Centers for Disease Control and Prevention (CDC) and the World Health Organization (WHO) for updates and guidance. 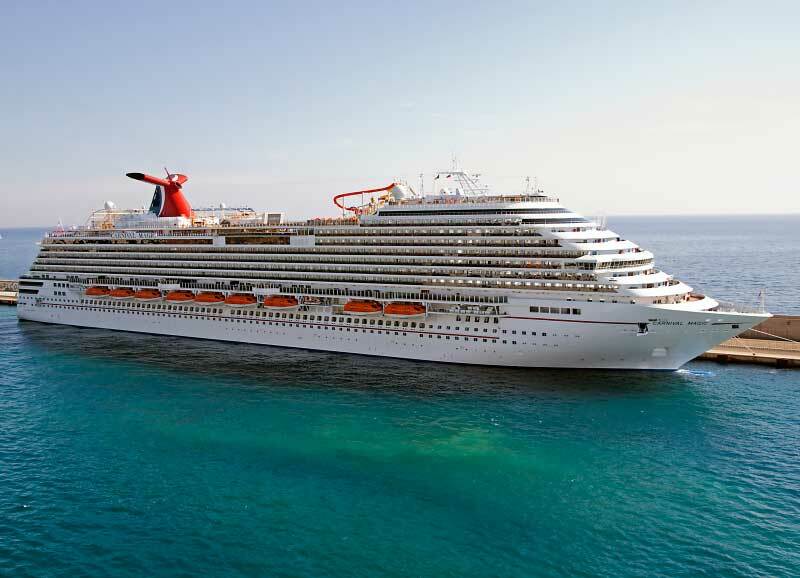 Carnival Magic is based year-round in Galveston, TX and operates seven-day cruises to the Caribbean. The ship departed Galveston on Sunday, Oct. 12 and will return on Sunday, Oct. 19. A judge has threatened to block cruise ships owned by the Carnival Corporation to dock at U.S. ports.